Hope you had a good holiday and rested well to start the new year. I went to the Japanese most sacred and ancient place, Ise Shrine in Mie prefecture with my family. (Photo attached). 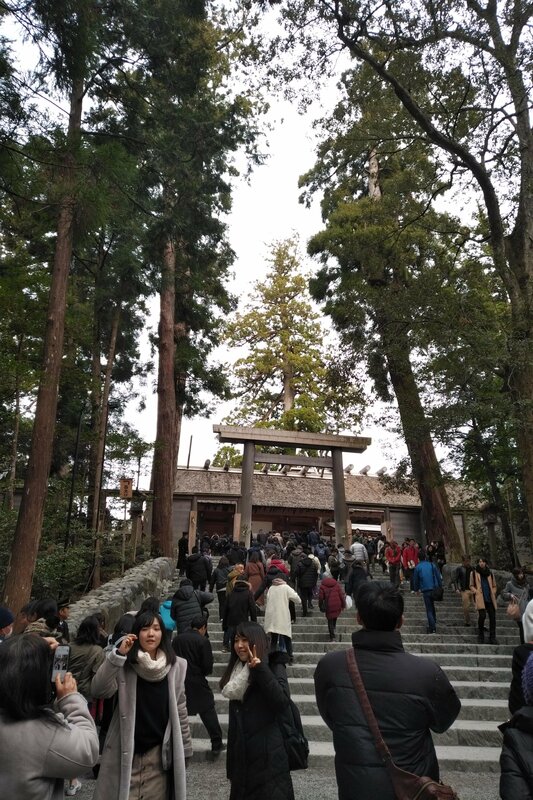 Many Japanese people visit there at least once in their life time and there is Amaterasu Goddess there with many other divine beings. She has the divine mother-nature and nurture and grow our divinity. Its divine power and ancient story are very famous, so it is highly recommended to visit there if you visit Japan. 2019 – Energy has shifted from 2018. I’m back from Japan last night and will start face to face session from 17th in London. Up to 2018, Energetic nature of the cycle was to release the past pain, trauma, and old patterns and shift your consciousness to the divine one to fulfil your life, mainly. Higher dimension has been filtering and selecting people who can work closely with them when people are ready, so some limited number of people who transformed their consciousness with love by removing their shadow and ego, have started moving into a certain higher dimension, but many other people are be still in the same old cycle to learn whatever they haven’t learned yet, shed the negative ego and raise their vibration. There are many different portals however, this is the overall trend so far. How is your life and consciousness shifted so far? How happy and authentic are you? How much love do you share? Higher dimension don’t care how much money you have, and what social status you have even though they can help you for that. 2019, the aspect of the yearly energy has been shifted to push you further to your divine path. In another word, you would be able to start enjoying the outcomes of your efforts you made so far gradually, step by step. If you haven’t made efforts yet to transform, you would be still in the cycle of learning till you learn and make a change. Time is NOW to shift your consciousness, at the beginning of the new year. If you don’t set your intensions for this year to manifest your divinity now, when would you do? Power of intention cannot be underestimated f you want to make a change. What is the biggest difference between people who live with a “survival mentality” and a “happy and abundant mentality”? How ‘successful and happy’ people differ from people who are complaining about their life with no money, no love, no friends? How can you transform you to the best version of YOU? You will have opportunities to learn and make a change in life from our special Jan events below. Having said that, if you haven’t received 26 DNA Activation or Remote Spark of Life session, to activate your physical and spiritual aspects of you, it is highly recommended to received both of them soon. There are many energy work available but DNA Activation is a solid activation which was tested and handed down from the wise king, King Solomon 3000 years ago, nothing new age about. Authentic and powerful activation. I personally was impressed by Spark of Life remote session as you receive the energy from the Great Central Sun to repair your energy and activate your light body by the ancient mystery school method of King Solomon lineage. These sessions are nothing new age about, same with DNA Activation. When I was learning a new age method over 14 years ago at the beginning, there was no solid and universal and esoteric contents I learned. It means it was too weak and didn’t make a change from the deep core level as there was no solid and authentic connection with the Hierarchy of Light, which is the spiritual governing body of this earth and they are the authority. Any proper healing and reading need to have the solid connection with the light, not the darkness. Humans / gurus do not have any divine power, and all the divine healing power and divine messages are coming from the Hierarchy of Light. We are only the “pipes” in that sense. Healing and reading without this connection, what do you think what it is? If you gain the connection, how does it make a change in your life? In Feb, you can attend the Archangel Michael Initiation Seminar on Feb 22nd, or Usui Reiki Seminar Level 1 on Feb 16th, if it is your interest to gain the connection. – Part 1 & 2 attendance is limited. The remaining is 7 seats only. – This is a seasonal workshop. 21st is a super powerful day. If you want to learn how to make a change and balance your life overall, this online workshop is for you. ★ 22nd Tue 22:30-23:30 remote session – Galactic Light Clearing and Light Body Transmission. How have you set the energy and manifestation for the near year 2019? Jan 21st Moon is a super powerful day as it is the Eclipse, Super Full Moon in Leo, so whatever the work you do with us on this day can potentially have 1000 times more powerful to manifest. Up to 2018, there have been energy available to mainly work on your inner aspects such as releasing the shadow, past painful memories and trauma, and exploring what you really want to do. But 2019, the energy is changing. Many people who are studying spiritual matters and practice them may not be taught the importance on working on themselves and making a change in their physical aspects on top of the energy /spiritual aspect, and they may tend to passively just receive psychic readings from someone who may look having an “Authority or power” to them and live a life as a powerless human being giving away their own power. How are you living as a queen or king of your own kingdom? You need to regain your own power and stop living as a passive and powerless being if that is the case. At this group online workshop, you will learn how to make a change in your life, and have time to make a change in your own patterns to manifest what you want to do in your life. You will be guided to become connected with the higher dimension and have time for the an energetic transformation. – What is a real spiritualism? – Hands on work – Recharge your energy with the Super full moon energy : This is a guided energy work and Kei will guide you to take to the higher dimension. – 2019, Jan 21st Mon. 17:00 -18:30 (90 ｍins). London, UK time. – This workshop will be organised by Zoom (Online). – You will receive a link and need to download the free Zoom app on your laptop or mobile phone to attend in advance. – At the beginning, it is a seminar style. After that, there is a hands on practical work for you to transform your energy and manifest your dreams. – By Jan 17th, you will receive a link of the seminar by email to your email address of payment. – Please note this is not refundable once you book your seat. – Since you will have time in the latter part of the workshop for the guided and quiet time to connect, please make sure you are in a quiet environment for your own benefits. At that time, all participants will be muted so it won’t affect other participants. – You are allowed to join the workshop even if you are late till 17:30, but after that, please note that the attendance is not possible.